32 players took part on a beautiful sunny morning, with a slight breeze getting up during the round. There were several good scores, but it was the anglo-irish partnership of Joe McManus and Barry Barker who came out on top. I have been away for a week in the UK, but the course has really come on in that time. The greens were excellent, and the approaches around the greens were immaculate. 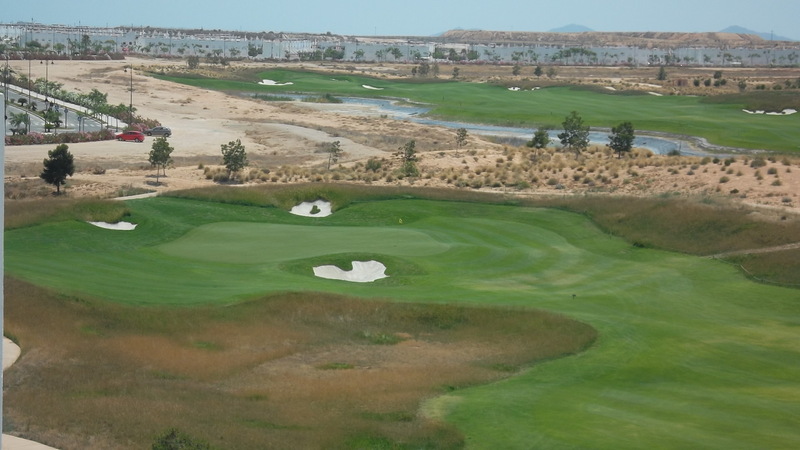 The striped fairways added to the overall effect. Next week is the Apollo Air sponsored monthly stableford. In 2 weeks there are 2 majors played simultaneously. 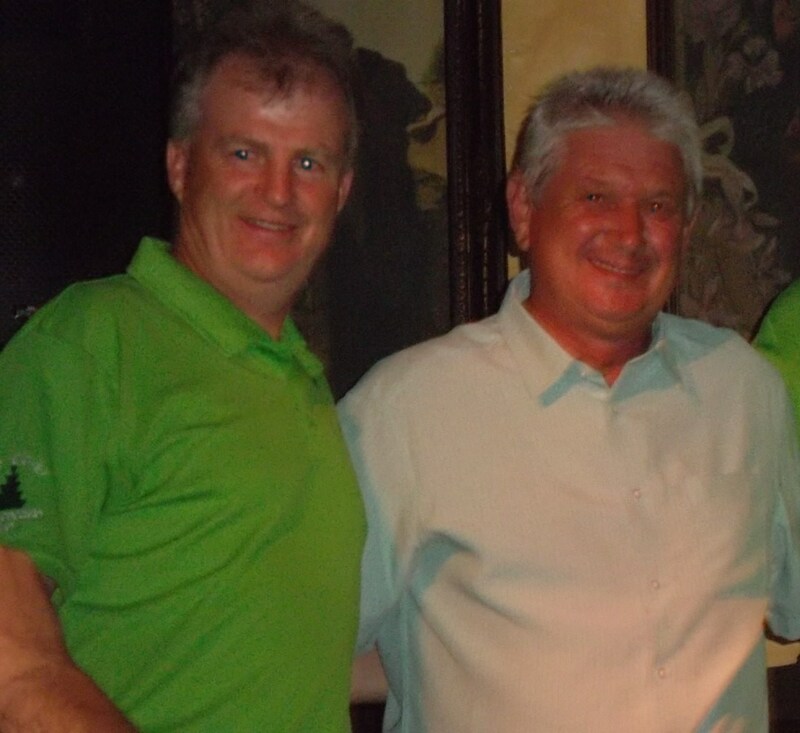 the Barry Barker Strokeplay and the Paul Harrington Scratch Cup. The evening presentation is at the Amapola restaurant in Bolneuvo around the pool. There will be live entertainment from Lenny Mitchell and it was a great night last year, so get your name down with Kevin (17e for 3 course meal and bottle of wine between 2). Transport is also available at 5e per person. This week was the monthly Apollo air trophy, once again a big thank you to Steve from Apollo air for his continued support of the Golf society. We had 35 players in a individual stableford, weather was perfect and the greens and fairways continue to improve, the fairways are now very green and looking very good, and the greens are getting quicker. Members draw, 227 – Jane Skynner, 40 – Karin Dahl, Please note that the winners will receive 2 green fee vouchers each, and they have 1 month to claim there vouchers please contact bookings@cdagolf.com to claim. This years Viking Cup will take place on Tuesday October 22nd, we have already received enough requests to play to fill the UK & Ireland team. We have yet to receive the official Norway / Scandinavia team list, anyone interested in taking part should contact Jan Skjold. What do you think about this rule that Chris has uncovered? It is similar to the area in front of the 11th green. Q. Stakes defining the margin of a water hazard were improperly installed. As a result, an area which clearly was part of the water hazard was outside the stakes and, thus, technically was outside the hazard. A player’s ball came to rest in water in this area. The player claimed that, in view of the alignment of the stakes, his ball was in casual water through the green. Was the claim valid? A. No. The Committee erred in not properly defining the margin of the hazard as required by Rule 33-2a, but a player is not entitled to take advantage of such an error. 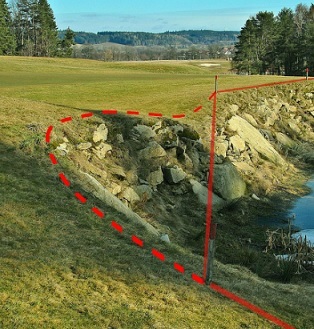 Since it was clear that the place where the player’s ball lay was within the natural boundaries of the water hazard, the claim should not be upheld. 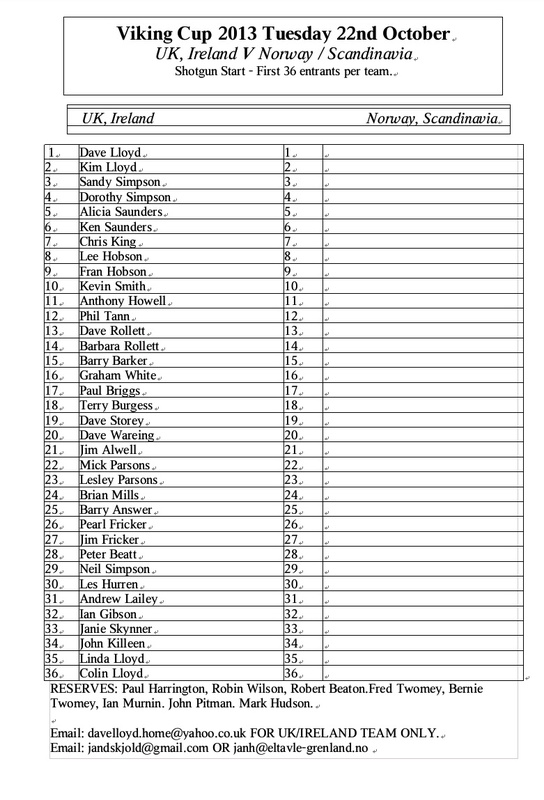 43 players took part in what was a difficult format, with all 4 players scoring on the last 6 holes. The weather was hot and sunny, which was unfortunate as play was slow as players searched for their balls in the long grass. 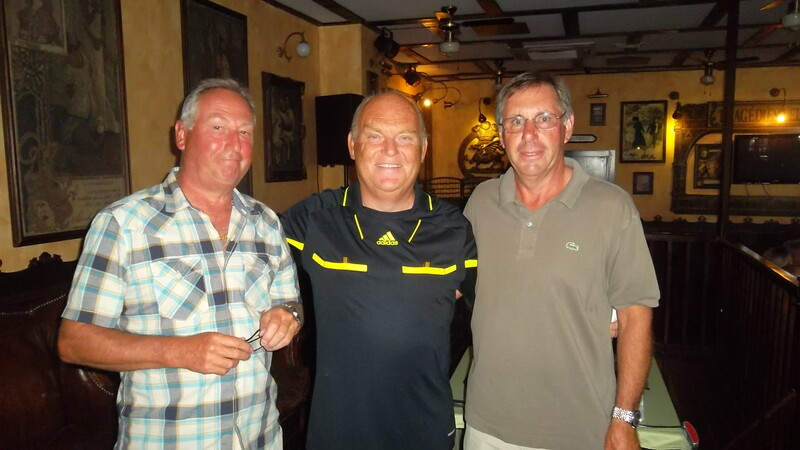 A shame only Peter was at the presentation to collect the team prize. Standing on the 1st tee, I suddenly thought of a name for our team. I called it the Cluedo team – why? Kevin wore plum, Mark was in red. I wore green and Tim was in yellow. So we had Professor Plum, Miss Scarlett, Reverend Green and Colonel Mustard! But we played as if we hadn’t a clue (doh!). Next week is the Apollo Air sponsored monthly individual stableford. It is nice to report that the course has improved over the last couple of weeks, with the fairways looking much better after several cuts. The greens are also improved with little trace of the sand from the hollow tining. Several players complained about the length of the rough, but it is a championship course and you only have to look at the problems the pros are having this week at Merion (or any other Open venue) to realise this course is set up for the top golfers, so we just have to try and hit it straighter! On the downside though, the constant watering put onto the greens, fairways and rough has resulted in the bunkers being wet and making recovery shots difficult. After posting last week that names for the Viking Cup should be sent to the organisers, the UK & Ireland team is already full with some reserves (4 months before the fixture). As it is a shotgun start we will try to book more times on the holes following the par 5’s so we can accomodate another 16 players. Afraid I have to go to the UK next week so Phil or Kev will compile next weeks report. Sorry there was a mistake with date. It will be on Tuesday October 22nd. It was amended yesterday on here and eye on Spain but some who viewed before that may be confused.